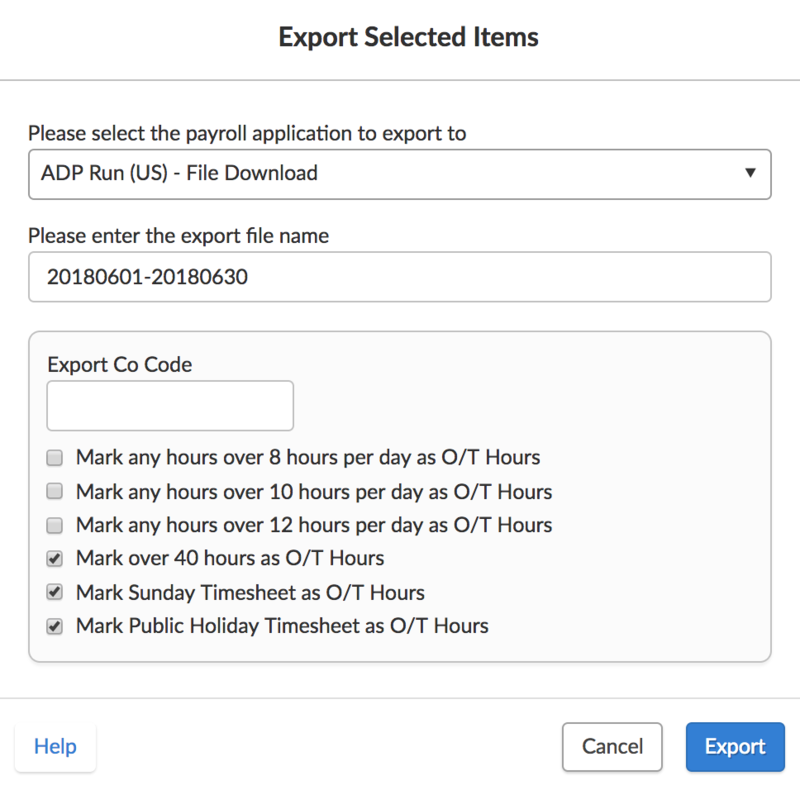 This guide walks through our timesheet export process with ADP. Timesheets from Deputy can be export via file download, or over the air (no file download required). For file download exports, you will need to ensure that the file is downloaded to a place on your computer that is easy to find. You will need to find this file when importing into ADP. Ensure that you have timesheets approved before you begin the export process. Please note: Employees need to have assigned payroll IDs before you can export them. If they do not, you cannot export those particular employee's timesheets. 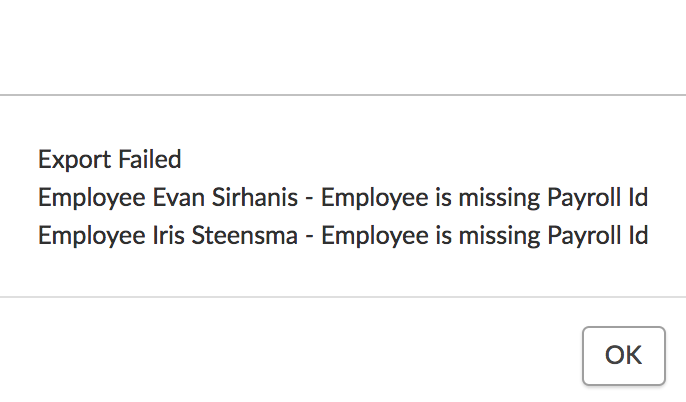 Navigate to the Export Timesheets tab and select the employees you would like to export. 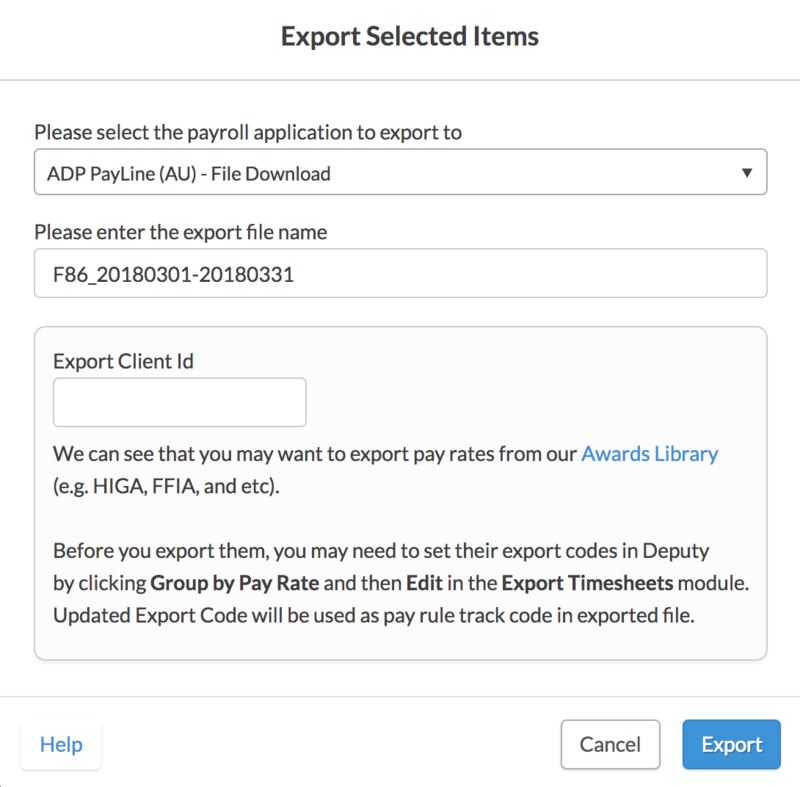 In the pop-up window that appears, select between ADP PayLine (AU) - File Download or ADP Run (US) - File Download, depending on which system you would like to export to, then click 'Export' when you are done. 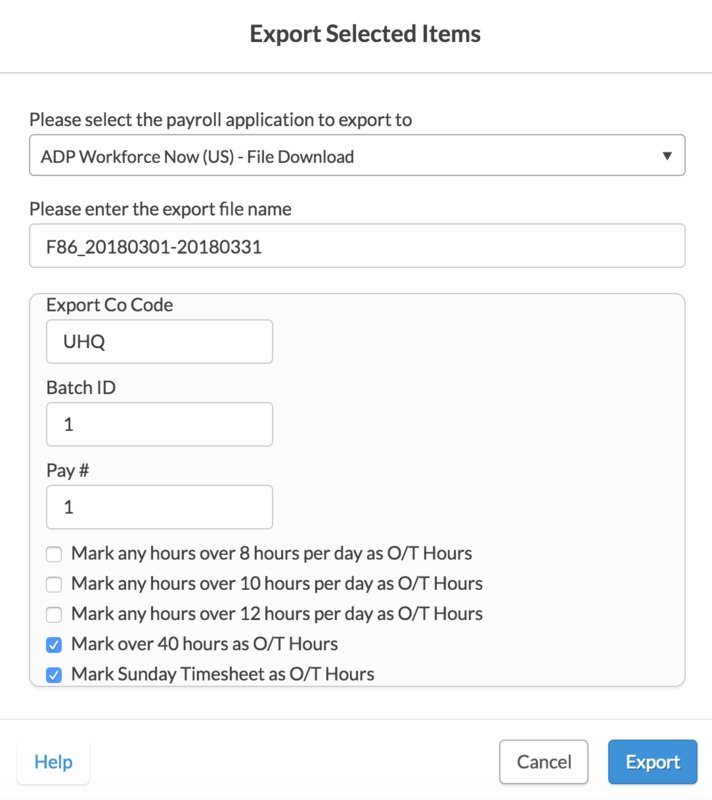 With ADP PayLine (AU), you can change the export file name, and you can also modify the Export Client ID. When you are done, click the 'Export' button, and you will be prompted to name this file. So, if the Export Co Code is UHQ, then your file should be named PRUHQEPI.csv when exported. 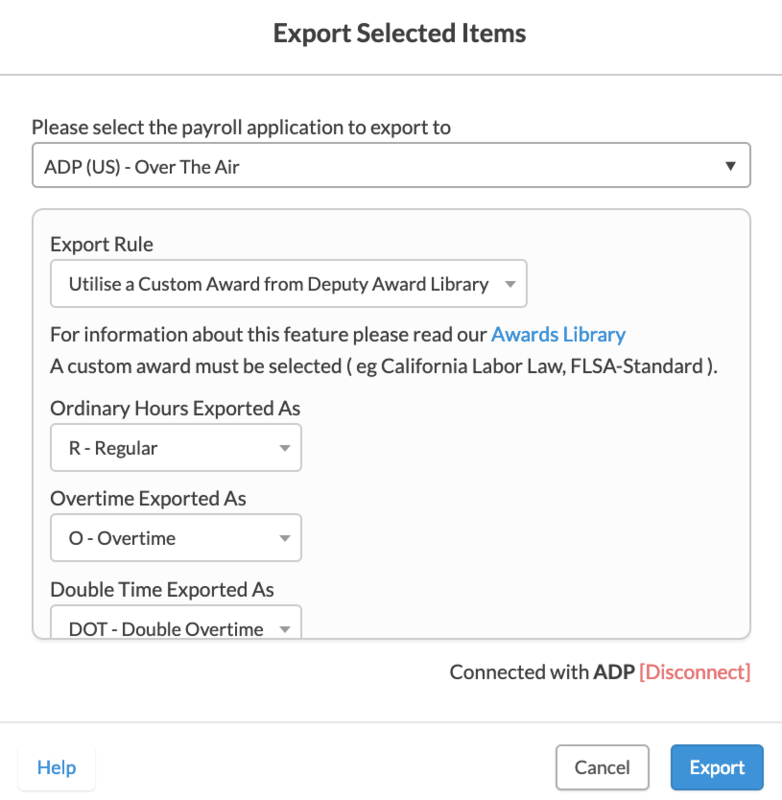 In order to export timesheets to ADP over the air, you first must connect you ADP account to Deputy. View our guide for ADP Run (US) or ADP Workforce Now (US) on connecting your ADP account to Deputy. *Please note - for ADP RUN, that we can only export timesheet hours for 1099 CONTRACTORS if the account only contains 1099 CONTRACTORS. We do not export timesheet hours for 1099 CONTRACTORS if the account also has W2 employees. Use the location selector in the top left corner to choose a specific location to export, or all locations. 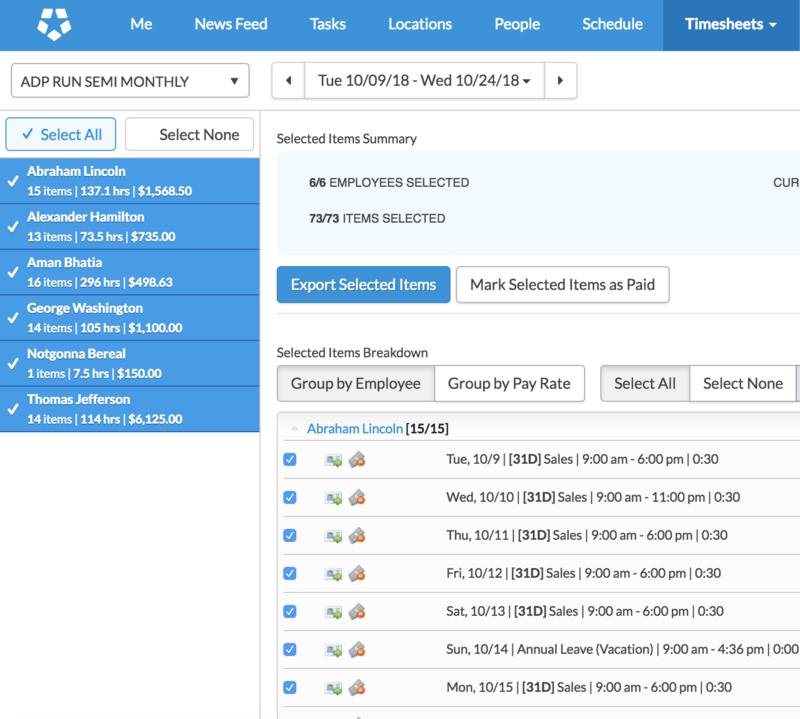 Use the date selector to match the export dates in Deputy with your Pay Frequency Period start and end dates. You can find these in ADP Run under Company->Pay Frequency. and in ADP Workforce Now under Process->Payroll->Payroll Schedule. If the dates above do not match, you will not be able to export. 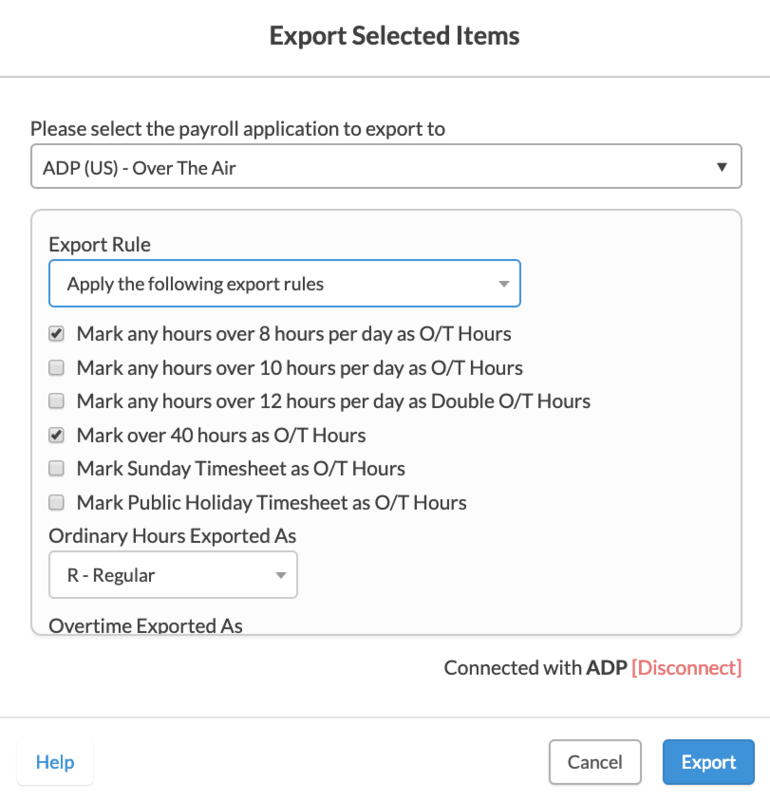 If you are exporting for multiple Pay Frequencies in ADP Run, export only the employees associated with a given Frequency. 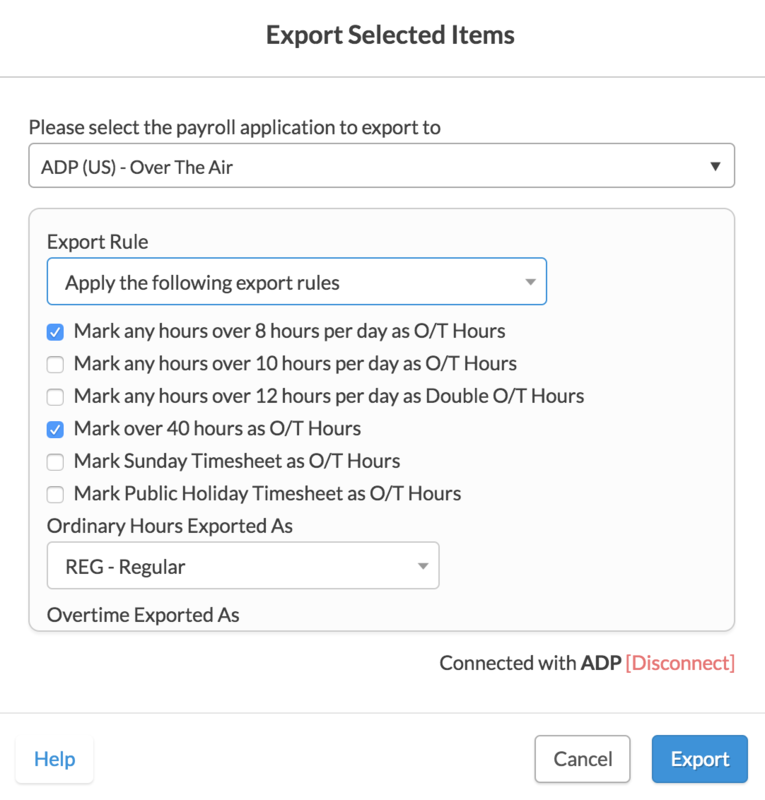 Each unique Pay Frequency must be exported separately, and between exporting different Frequencies you will need to finalize the export in ADP. You will receive a notification that it has gone through successfully. 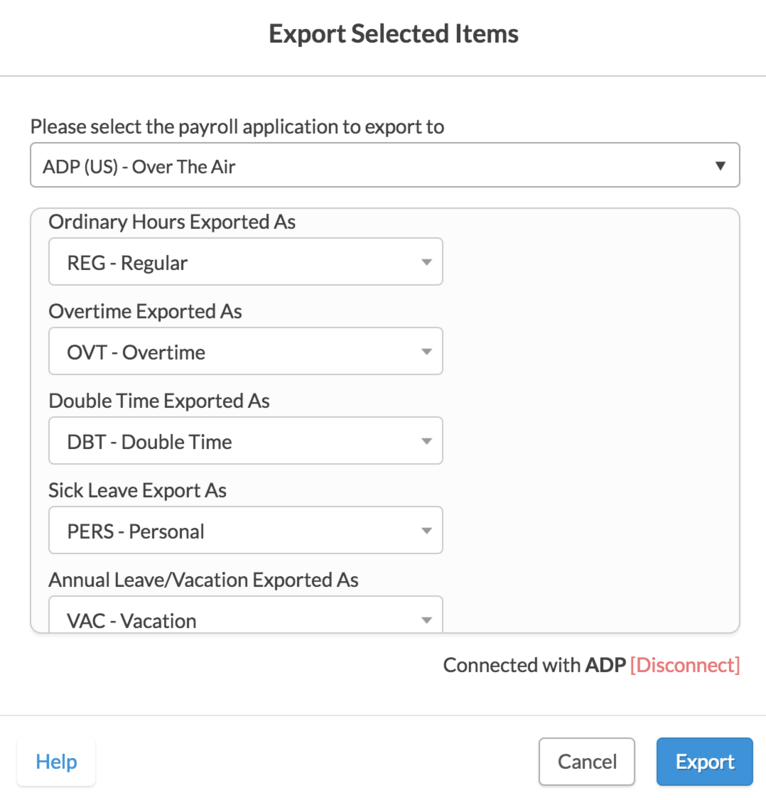 For ADP Workforce Now's over the air payroll export, Tips have limited support. 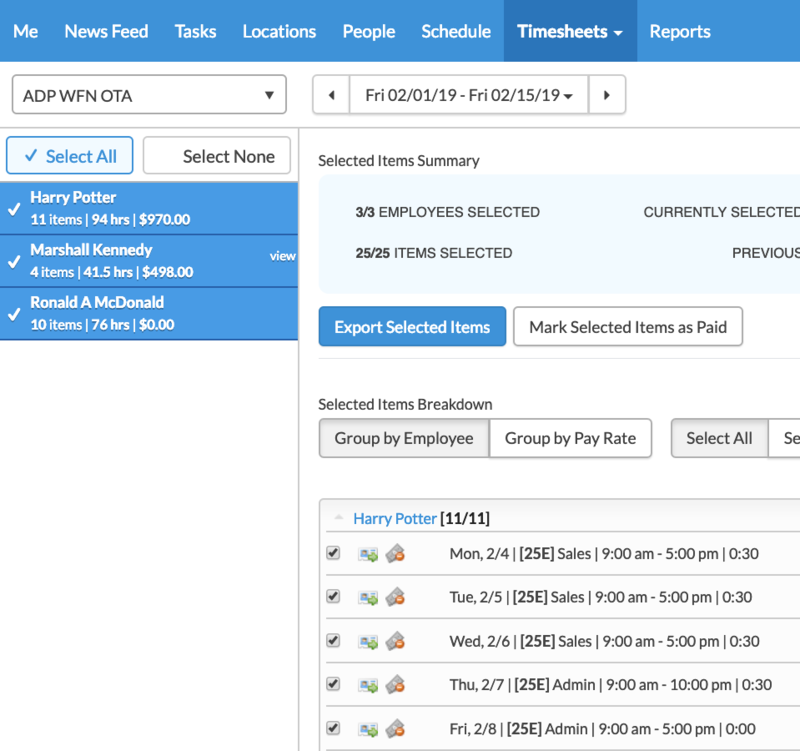 If Tips are cash and have already been paid to the employee, the payroll administrator should also input a deduction for the tip amounts for each employee in ADP Workforce Now. If Tips are from credit cards or otherwise still need to be paid to the employee, nothing extra is required. 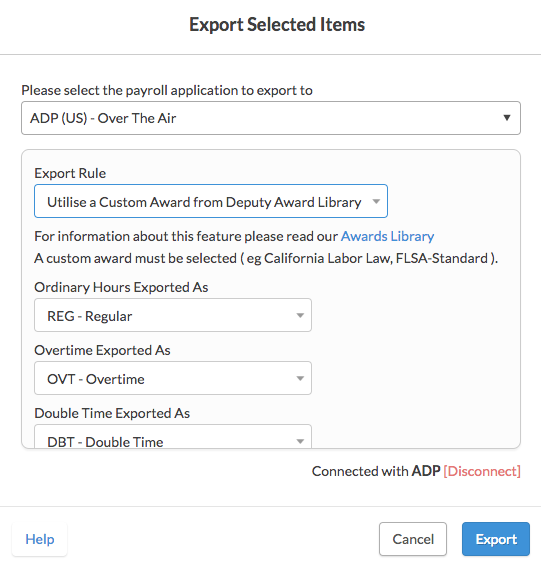 All Tips entries will be accompanied by a reportable earnings and benefits amount in ADP Workforce Now when exported from the over the air payroll export.